Two things influenced this: first, to blog more regularly and second, to stick with yesterday’s theme of purging. I have long followed Flylady and love her ideas and practices. One thing I have found very effective though in working through clutter, is to follow a few simple guidelines. I’m not sure Marla and I would agree on this strategy, but I hope you find it helpful. 1. 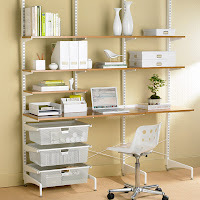 Pick an area to work in (a drawer, a dresser, a closet or a room). If you have 10 mintues, a drawer. If you have a Saturday morning, a room. 2. Empty it. Yep, completely. All of it. The only sorting I do at this point is if I see anything that is obviously trash, it gets canned right away. 3. Clean the area while it’s empty. Clean it like you have to sell the house and this will be here, empty for all the buyers to see. 4. Sort what you have based on use/size/categories logical to you. For instance, if I’m sorting in the garage: camping items are together, kids toys, car maintenance, etc. As I’m creating these groups, I’m evaluating items to see if they need to be tossed/donated/repaired. 5. The most essential part: when putting things back, they must go into their home immediately. Every item kept must have a place it belongs and that is where you put it. Don’t put a small stack of shirts on the closet floor, for example, and tell yourself you will decide later which ones to keep. When putting things in their home, I find it easiest to start with the largest or oddest shaped items for space planning and the most essential items. 6. As you are working, have a notepad (I like the one in the back of my planner so it’s not easily lost) and jot down things that need to be done as a result of this purging. Donate items to Goodwill, have black skirt repaired, price out double hanging rod for closet, etc. After you are done with the project, take the to-do list and decide what days in the next week or month that you can cross it off and schedule it for that day. Translation: consider this an excuse to drive to a nearby Container Store or Ikea. I’m sure many of my military friends are Pro’s at this, but I hope some of you will find this helpful. I’m hoping to start Tuesday Tips as a weekly blog, so share your ideas or suggestions of topics (parenting, school year, organizing, decorating, friendships, pets, crafting, etc) for future weeks.